Had a close friend and amazing athlete ask me those questions that we fail to confront. They cause anxiety and paralysis. 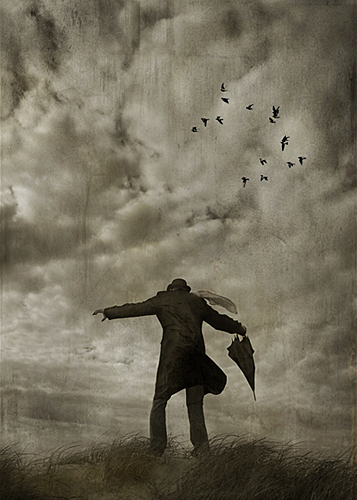 We run maddeningly from one thing to the next slopping ink on our check off lists without a moments reflection as to WTF or Why(TF) we are doing it. a) Finish race, foremost. I failed to do this in 2005 when I was a complete greenhorn and was clueless about how to race an ultra. I have to finish this race! b) Qualify for RAAM. If my time is within a certain % of fastest ‘racer not already qualified for RAAM', I qualify. c) I want to be the first place ‘racer not already qualified for RAAM’. I don’t know if I can beat the big boys, but I want to be in the running. b) Learn about my body in this new medium of racing. I need to finish, so I can’t open the throttle fully. But I want to push it harder and harder to the end and maybe crack the top 5.
c) Finish within 24 hours. b) Finish mid to front pack. c) Make a name for myself as young gun at and event with the world's greatest. This was invite only. The primitive, possibly genetic, inclination for exploration. There are no regions of the Earth for me to be the first person to arrive and conquer. There are no Napoleonic conquests to be taken (not that I’m really into conquering peoples). I thrive on conquering myself. As of this nano-second there are regions of my body, my being, and my soul that are untapped and veiled from my consciousness. They are waiting and perfectly content for me to live a life unexamined. Is there a tangible or quantitative payoff awaiting? Nope. Just the fact that there is the possibility of unlocking more of myself is a call to action in and of itself. This second I cannot accomplish the above agenda. But with ruthless dedication I can. I can find that new continent. I can found that new nation. I can be that new level Being. That is encoded into the exploration quest that is in our genes. And I believe within my body there is more than continents, planets, or even stars. What are you trying to prove and to whom? I’d like my actions (and maybe my reflections upon said actions) to rattle, irritate, confound, and, yet, hopefully inspire the apathetic despair I see in 99 out of 100 Americans who bought into a false dream about what living is. I do have chips on my shoulder. Hopefully when I cross the finish lines I will see how silly, unnecessary, and actually counter productive they were. Why are you trying to be successful at something that requires pain, suffering, and sacrifice to achieve at the highest level? Anesthesized comfort and indulgence is cheap. It’s a talking point everyone has bought into as being of value. I want what I can’t have, what pain, suffering, and sacrifice prevents everyone else from getting. Beauty comes in many forms, and it is always wielded by an artist. That artist is doing something previously undone. Doing the undone is never painless. Is there a perfection of the ascetic life of a pro athlete that appeals to you? Yes. I was a self imposed ascetic from age 13 on. I got my first bass guitar then and ruthlessly focused myself upon it as if it were a religious icon. I went through two teachers and all their knowledge by age 16. My third teacher was on another plane of existence. Greatness is beautiful. Greatness comes from committing to something beyond any conceivable understanding of the average non-artist. Being an artist is being an ascetic. It’s going after something greater than yourself. Something greater than the money, white picket fence, and cushy life. Something so amazing that consumerism is a laughable matter. And in this lies a perfection. My house burned down? I can still play a Bach Cello Suite like no one else! My car got stolen? I cracked 36 hours in EpicMan! My IRA went to $0? I’ve lived life with deep relationship with actual Being in this strange cosmos. I feel honored that my dear friend (and wicked sick athlete) Mike Flarty, thought of me when he came across EpicMan. It was a compliment of the highest degree that such an amazing event would bring my name to his mind as a possible entrant. He suggestion to me was correct. This race was what I have been waiting my whole life for. The excitement I feel eclipses how I felt going into Kona 06. Simply put: Triple Ironman on Oahu, Hawaii on New Year's Eve. Done. Done. Done. I had to register. My imagination was blasted to pieces...I want this. I want to race this race with everything I have. Due diligence was in order before undertaking such an investment of training, travel, and over-the-top dedication to a singular pursuit. A journey that would define my entire 2011 and usher in my 2012. I did what any information hungry citizen of this world does: Google it. The most prominent name that comes up when doing so is Jason Lester. Briefly, he's one Hell of a guy. Take a gander at http://www.jasonplester.com/ ! You'll find more than enough to freak out and demolish your perception of normality. I'm just happy to have had the chance to have been introduced to Jason, let alone invited to one of his races. He's done races like the Epic 5 (Five Ironman competitions in 5 days on 5 Hawaiian Island). He's insatiable and doing races I'm years away from attempting. Oh, by the way, he's racing with a disability, having no use of his one arm. Epic man here. Hence, more than qualified to put on the EpicMan. 7.2 mile swim - 336 mile bike - 78.6 mile run. And the clock keeps running. Last time I checked Hawaii was hot and humid. Think it still is. Will be racing from December 30, 2011 to January 1, 2012. Possibly the raddest race timing I've come across yet. Teamwork --It takes a team to WIN! A truly great cause and I hope to help contribute to their funds with my racing. Being a musician growing up I know the values instilled that last a life time. I feel a definitive connection with Jason Lester's cause and am proud to contribute in whatever capacity I can. I have been away from multisport for too long. After my meltdown at IM KY last year which resulted in an ambulance ride I've been trying to get my mojo back. (The broken hip that led me to bike WAY too fast because I couldn't run is healed and I'm ready to make my IM comeback). The catch is: I've done 6 Ironman Competitions. It's time to step up to the next challenge. I know I'm not genetically predisposed to running a 9.15.00 Ironman. But I sure can keep trucking. The entire early season of 2011 has been about going long. 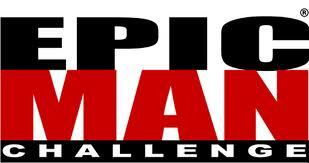 And with EpicMan I am going to put that to the ultimate test. I have been inspired by this event. It speaks to me in it's scope. It's on the very periphery of what I feel is possible. It's very close to what I consider impossible. But in my heart I don't believe that. I've got this. That is, if I push myself every day, every hour till then. There will be no more sleeping through 5am wake up calls. There will be no excuses. No pulling off the 100 degree track workout early. No skipping the transition run after a 150 mile mountain ride. There is only trained and untrained. And it is my sincere promise to myself that I will show up trained. I've scheduled two of the hardest races I could find as preparations. ADK 540 and VA Double Ironman (More on these in another post). It all adds up to EpicMan. It all adds up to a chance at stepping up to a challenge that can break me...and the chance that I can walk away chin high, and knowing I did everything I could to break a race that is build to break everyone but the best. My return to the road merited a new pair of road trainers. What was I looking for? Durability and enough shoe to keep ME from falling apart during 100 mile weeks. If I could get this durability in a low platform shoe I'd be thrilled. I'm not into clunky high heeled Asics design type wear. (And I am surely not drinking the barefoot Kool-Aid either). 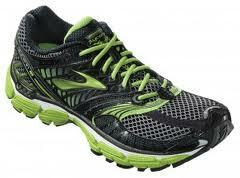 Brooks got everything right (in my humble opinion) with the Glycerin 9 and it surely merits a close look at if you are a Ghost 4 fan. This is not a racer by any means. For that I will always stand by my Green Silence by Brooks. However, for a high mileage show it's hard to believe how light the Glycerine 9 feels even if at 12.1 ounces. It's a smooth shoe. A luxury shoe without 'too much' shoe. I have a connection with the road with this shoe. I'm not being coddled -- I'm being respected as a runner. No one is smooth enough to not need some cushion when running 30+ miles at a time and over 100 miles a week. I need a shoe that offers the basics of injury prevention without completely removing me from the sensation of impact. This keeps you honest in form and ultimately keeps you from abusing yourself. The Glycerin is the heaviest of a shoe I will go...and they gave me maximum protection with it. Worth every ounce. Note to self: You're pretty freakin' slow these days. But that's ok.
Coming home for the first time in 6months has yielded some insight into just how drastically I was forced to adapt to ultra distance in the mountains. Common consensus? "Jason, you look huge." Healthy mountain air, I guess. But I'm slow as Hell. That's ok, though. Rocky was slow as Hell, right? 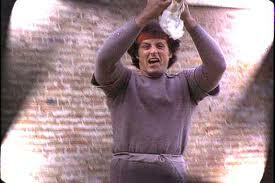 It wasn't until Rocky III until he went to LA to train with Apollo that he lightened up. 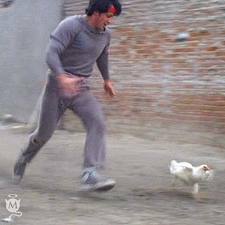 He did a bit of speed training in Rocky II. The whole chicken thing. I'm positive that there will be nothing graceful about EpicMan. Or even the double Ironman in October. Maybe for the first 8-12 hours. After that it will be brute fitness and capability to take what's dished to my body. Running fast used to be running 5.45 minute miles. Now it's 7.30. Hell, 8.00. Slow as Hell. But that's ok. If I can run 8 minute miles for 72 miles (after a 7.2 mile swim, and 336 mile bike) that will be FAST. A chicken catching 10.5 hour triple marathon. That is the magic number. I've done this before and I'm going to do it again. But this time with more discipline, rigor, and overall dispassionate intelligence. To race a Ironman fast I was doing 20-30 hours of training a week. That is NOT including time getting your gear together or breaking it down. It doesn't include stretching or showering. It does not include eating. That's 20-30 hours of straight aerobic and anaerobic conditioning on the clock. Mileage is something most athletes dispense in an effort sound impressive. But where are you doing your mileage? Florida athletes can't talk to Vermont athletes about mileage. But we all can comprehend 25 hours of quality lactic threshold enhancing swimming, biking, and running. 5 hours a day - 6 days a week. 30 hours blocked off on my calendar. Inviolate times. Sacred intervals sequestered from the day's stuff. This does not mean that I will train 30 hours a week every week. It means I can. And it's on me to follow through. No excuses but personal irresoluteness. I made it available to myself: my goal. I can choose to sleep in or eat donuts during said 30 hours. But that's my failure and my life to live.